So here we are again with the artist's father neatly attired and leisurely reading the paper in his sister's (Claude's aunt) garden. The sun is shining, the flowers are red, white and burgeoning. Monet leads us back through them and numerous happy shades of green to a distant stand of trees and soft clouds in the blue sky. Claude Monet, age 26, has painted the quintessence of family contentment. 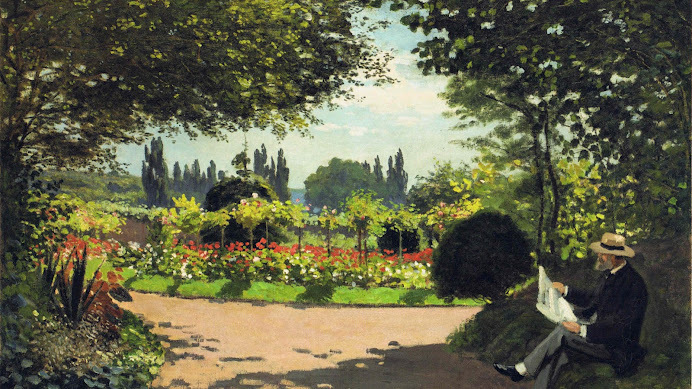 The beautifully executed painting shows Monet early mastery of his art. It also says something, hard to say what, about how his mind worked because Monet's circumstances and relations with his family were far from contented. He was at his aunt's in Le Havre - away from Paris and his pregnant mistress - as well as numerous creditors. Absolutely impoverished and unable to sell any paintings even before his son was born, Monet was now desperate. He had come to implore his well-to-do relatives for funds. But they would have none of it. They had seen Claude paint and spend money to the exclusion of their idea of sanity for years and the mistress and child out of wedlock were the final straw. Probably they felt if they refused him money, he would finally do as his father wished and join the family grocery business. But, of course, rather than get any work, Monet continued to fill his days painting - even at this most precarious of times. There are even some reports of a suicide attempt. (Which, given his indominable will to paint, be with nature and enjoy life, Ciwt seriously doubts). But there isn't a hint of his personal turmoil in this - or any of his paintings. What this was all about for him he alone knows, but the art world is better for it. (Shortly after this painting, Monet was saved - this time by a local Le Havre businessman who commissioned portraits of his family. And his aunt, who loved him very much, did finally give him some money. At other junctures his artist friends - many of them, like Renoir, with extremely limited funds themselves lent him money so that he and his little family could eat. This after days without any food at all).